The coffee giant is going small. Consider this the opposite of Venti. Drivers in Northglenn, Colorado, must have been surprised to see an entire Starbucks store rolling down the highway on a flatbed trailer. The store, which originally opened in 2012, was being relocated to a new site about a mile away. This would be impossible with a normal Starbucks location, but this cafe was different: It was one of the coffee company’s experimental mini cafes. Starbucks has built 45 of these modular coffee shops around the country. Taking a cue from the tiny house trend, the cafes are often made out of recycled shipping containers and other reclaimed materials, meaning they’re portable and eco-friendly. The one in Northglenn measures just 450 square feet. These tiny Starbucks stores have a much smaller environmental footprint than traditional cafes, taking less water and energy to operate. And since they’re pre-assembled prior to delivery, the company can choose "sites not designed for traditional store locations,” a Starbucks spokesperson told TODAY in an email. The first modular Starbucks store opened in 2011 in Tukwila, Washington. 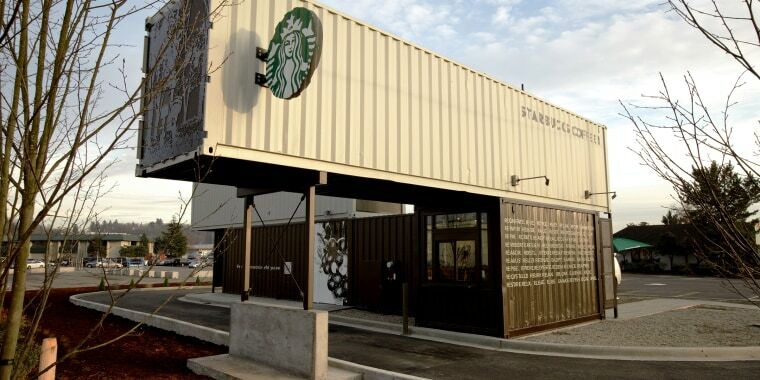 Made of four reclaimed shipping containers, it offers both drive-through and walk-in service. Since then, other locations opened in Salt Lake City and Portland, Oregon. These movable stores seem like a clever way for Starbucks to gauge a neighborhood’s appetite for lattes, macchiatos and Frappuccinos before committing to a brick-and-mortar location in the area. At least that’s how it worked in Northglenn. After the tiny store became popular in the neighborhood, Starbucks replaced it with a larger, permanent cafe — and the mini location moved to its new home across town. Are there more of these miniature cafes in the works? A Starbucks spokesperson didn’t have any details on the company's plans to build more. But if the success of Northglenn’s tiny coffee shop is anything to go by, Starbucks is onto something big.